Clashes between opposing political parties in Guinea's capital, Conakry have left one person dead and at least 50 injured. The fighting between supporters of former Prime Minister Cellou Dalein Diallo and the opposition leader, Alpha Conde, came a week before the second round of the presidential election. Both sides have agreed to suspend campaign rallies until further notice. Electoral officials are to decide if the run-off vote can proceed. But a government minister told reporters that the elections would be held as scheduled. The stone-throwing on Saturday and Sunday began after the election rivals both held rallies in the capital. Guinea's electoral commission earlier condemned the one-year jail sentence given to its chairman and another senior official after they were found guilty of committing fraud in the election's first round in June. It had been hailed as the first democratic election in the mineral-rich West African state since independence from France in 1958. In 2008, the military seized power after the death of the autocratic President, Lansana Conte, who had ruled the country for 24 years. The BBC's West Africa correspondent, Thomas Fessy, says Mr Diallo's Union of Democratic Forces in Guinea (UDFG) and Mr Conde's Rally for the People of Guinea (RPG) have both accused each other of provocation before the two men contest the election run-off in a week. On Sunday, rival supporters threw stones at each other in the suburb of Hamdallaye, where both candidates' parties have their headquarters, the AFP news agency said. Nearby cars were also reportedly attacked. Saturday's clashes, which left a number of people with serious injuries, happened near Mr Conde's home in the Mafanco district, as well as in Hamdallaye and in Dixinn, where the electoral officials were tried. Our correspondent says the politicians have called for calm, but tension is growing between ethnic Peul and Malinke - the two largest communities in the country. 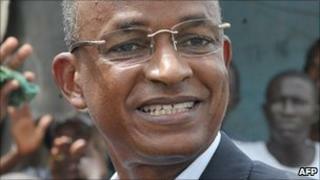 Mr Diallo, a Peul, is seen as the favourite for the presidency after gaining 44% of the first round vote, compared to 18% for Mr Conde, a Malinke. Despite being the largest ethnic group, a Peul has never been president. The Malinke are heavily represented in the ruling military junta. Guinea is the world's largest exporter of the aluminium ore bauxite. It also has important deposits of iron ore. But despite its mineral wealth, the country is one of the poorest in West Africa.